Monday’s shock news from the world of whisky was the press release, carried on Reuters’ newswire, that Remy Cointreau is in advanced talks to buy Bruichladdich. Yes, you heard me, the youthful, energetic, fiercely independent progressive distillers are talking about being bought by a multinational group. A number of questions might spring to mind, such as why is this news and why is Dav publishing opinions on the subject when he doesn’t normally chatter about current affairs on the internet and why’s he taken four days to get around to hitting the publish button. Mostly, this is published purely for sake of my own vanity and I get to be an over excited fanboi on the internet if I want to. Provided I don’t make a habit of it, of course. If by some faint chance of fate that somebody from Bruichladdich winds up reading this: Hello! In the interests of full disclosure, I have exactly no knowledge of the situation apart from what’s in the public domain on the internet. 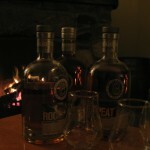 I found out when Mark Gillespie broke the news on the Whisky Cast’s Facebook page, and have found out what’s going on mostly from reading twitter, the press releases and Remy Cointreau’s annual report and accounts. I’m going to start with a tangent. Humans like stories and narrative. That’s why reporters tend to include people’s ages in news articles, to add human interest and engage with the reader. It gives the reader a greater sense of being involved and generally keeps marketing departments and packaging designers in business. People also like triumph against adversity, cheering on others who are putting in heroic efforts, to succeed despite the odds, for the sheer passion of doing what they want to do. 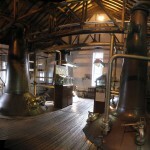 Single Malt Whisky trades heavily on the back story of how that drink came into being, the distillery’s unique history and buildings, the region and countryside, and maybe some of the people who made it, conjuring up poetic images that spark imagination which ultimately leads to more sales. Stories from books and told by other people are good, but they pale in comparison to stories experienced first hand. Hence why I’m writing this. 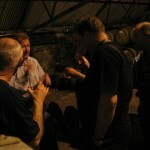 My personal story was stunningly lucky to intersect with Bruichladdich’s for a magical week in September 2009. One day whilst I was there, trying hard to remember everything Jim McEwan was saying, I mentioned that I liked reading the Bruichladdich Blog, I found it to be an interesting insider’s view into the murky world of international Whisky industry and wondered who’s insights they were. About 30 seconds later, I found myself in a total flap, trying desperately to think of intelligent questions to ask Mark Reynier, the charismatic and energetic CEO himself. I know I can go off on one, but oh boy can Mark talk when you get him started on a topic he’s passionate about and knows inside and out. This is the man who most credit with having this crazy idea of resurrecting a dormant distillery, who upon being told it was impossible by people in the business, went away, found some equally farsighted and courageous backers and went ahead and made it happen anyway. I won’t retell that story here, but if you don’t know it, then I encourage you to go buy Whisky Dream: Waking a Giant, it’s well worth reading in its own right. Anyway, one of the many characteristics that’s endeared many people to Bruichladdich is that it’s been fiercely independent, often poking a metaphorical stick at the multinational companies that dominate the whisky industry. I’m guessing that this is why reactions to this news have been somewhat polarised, with more than one negative opinion being voiced. But to flip that around, it seems harsh indeed to have to take flak for something you’re proud of achieving, but how successful should you feel if people get this excited if they perceive a risk to something you’ve helped build? 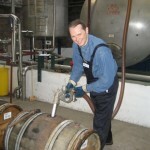 After all people fail to get up in arms when other great distilleries and breweries change hands. Lets not forget for a moment that we’re talking about a business, with shareholders, a board of directors and employees (who I think are also shareholders). Admittedly, these people were more in it for the passion rather than a calculated risk on a financial return, but business is still business. In the world of business, things change. People are generally allowed a reward for years of hard work. To me, it seems a positive step if somebody makes an offer the shareholders cannot refuse, and can contribute an international distribution and logistics system that would let the distillery focus on the creative business of turning out a fantastic dram and not have to waste energy on the paperwork required to get the product to market. I can only begin to imagine what the recent weeks must have been like for Bruichladdich’s CEO. I would struggle to imagine putting my life into something for 10 years, building it up into this really unique thing that gets people excited the world over and then the best thing to be done for it is to walk away? It’s almost certainly great news for Bruichladdich, but a bitter pill indeed to be ‘surplus to requirements’, although that’s pretty standard when any company is bought out. In my opinion, many people’s reactions remind me of the Change Curve: Shock, Denial, Fear, Anger, Understanding, Acceptance. Give it a few weeks after the deal’s finalised and the world fails to end, and I think things will quieten down again. I don’t think it’s a terrible time for Bruichladdich to change gear. They’ve spent 11 years re-establishing the brand, building a unique product range and they’ve been working for long enough that their mainstream product is now of an age for some real volumes to come online. I suspect there’s still a bit of innovation still to come out of Jim’s tasting lab, but backed up with the confidence of being able to supply a higher volume than before. I can’t believe that Remy Cointreau would be daft enough to break something they’ve just invested £undisclosed in and even if they did ruin the distilling process overnight, it’ll take another 10 years for the product being marketed to change and that’s more than enough time to buy several lifetime’s supply. It’s certainly cause to sit up, take note and maybe buy a rare bottle or two or even a whole cask whilst they’re still available (if you’re the sort of person that would actually know what to do with 300 bottles of their own whisky), but what changes could the future will bring? What, ultimately is the worst that could happen to a single malt distillery in a group that has no other whisky holdings? It’s not going to be thrown into a bulk blend and it’s not going to be ruined for a profit because despite Bruichladdich’s impressive €15m turnover, that’s a drop compared to the parent company’s throughput. I could believe that maybe prices could go up a bit, maybe demand for the 10 year old increasing markedly as it enters new markets and maybe some measures taken to maximise supply, such as no more independent casks (when was the last time you saw an independent Lagavulin? exactly). But further into the future? Who knows. Myself, I’m quietly confident and to Mark Reynier, I will raise a small dram of the precious Octomore I was lucky enough to put into its Chateau Y’Chem barrels for its last 6 months maturation and fail to remember the toast I was taught one Thursday night on Islay.. This entry was posted in General Gubbins on July 12, 2012 by Dav Stott. Whilst I’m in a confessional sort of mood, I felt moved to write about one of my chief vices in life, exploring and learning. My particular brand of inquisitive curiosity has often lost me some time when I’ve let myself get distracted by an ooh, shiny! The internet’s been most complicit by making it easy to indulge myself by following tangent after tangent (Nerd Sniping). Until recently, most opportunities to learn online are just reading, be it text on a web page or some code from a repo. That changed for me last year when a few keen professors at Stanford University decided to put their energy behind a collection of online versions of their classes. It’s been a year or 20 since I was last at school, so my idea of the state of the art of learning is somewhat out of date, but I’m still impressed how a small smattering of technology can go a long way. I don’t find much mystery behind building the web delivery mechanisms, so I have to wonder why now was the right time for this to gain critical mass, when companies pushing online training software have struggled for years. I suspect it’s a combination of technology and the Silicon Valley effect. These weren’t just putting a camera into their lecture theatres, like some people have tried before but really applied themselves to presenting the materials such that the pupils really got to engage with the course content. Primary instruction comes from lectures designed for the screen, bits of powerpoint, pieces to camera and good old chalk and talk. These are typically cut up into bite sized chunks and interspersed with little (1 or 2 question quizzes) timed to wake up the viewers at home. Then there are the tests, because everybody likes getting scores at the end of the term. So far, these have been open book exams to test understanding, not memory, but they’re not invigilated so it’s hard to use them as a basis for an accredited qualification. I know I haven’t sat an exam since the 1990s, but I always struggled at memorising formulae and being able to refer to notes and text books was a personal revelation. When I took part in last autumn’s Introduction to Artificial Intelligence, the biggest sense of participation came from the structure to the course, with deadlines to keep things moving forwards at a syncronised pace, homework to make sure you actually finished the week’s content and a couple of exams to check things had sunk in. I was testing myself to see if I could knuckle down for a couple of evenings a week to see if I could still do proper learning. It turns out that that focus generates quite a lot of energy and excitement, which meant a community sprang up amongst the 150-odd thousand pupils, facilitated by an OSQA site aiqus and the ubquititous reddit. Also, just knowing there are several dozen thousand other people doing what I was doing had a certain cool factor. I was reading some blog posts on the nature of Peer Instruction the other day. Two things sprang to mind about it, revision theory aside, nothing helps cement learning more than teaching it to somebody else and it just plain gets people’s brains working, rather than just sitting back and letting it wash over and through them. Think back to a good conference you’ve been to. Can you remember more from the passive talks or from the heated discussions in the queues between sessions, or down the pub afterwards? Who’s running this show now? Citation needed, but I strongly suspect that we’ve got Sebastian Thrun to thank for a lot of this. Throughout the AI class, he struck me as being the sort of person who’s enthusiasm was infectious and wouldn’t take no for an answer. He and Peter Norvig pretty much went ahead with AI class regardless of the consequences, rather than delaying kick off until everybody’s concerns had been addressed. The other major class was in Machine Learning, given by Andrew Ng who is another huge name in Academia. So far, these two classes have succeeded in acting as prototypes for their respective software platforms. AI-class handled most of its content in house (using Amazon EC2 for hosting) but left its video to Youtube to handle, which means it didn’t need to worry about CDN. At the time its company was known as Know-IT Labs, now it’s launched full scale into Udacity. I get the feeling that this organisation is spreading its content along personal lines, finding people through personal contacts who can be talked into doing it because it’s fun as well as useful. MI-class has evolved into Coursera and has a similar technology stack, but it handles the videos in house using HTML 5 and its own CDN (currently cloudfront I think). They’ve engaged content from many different universities and have already established a big portfolio of classes, which is very impressive given the time involved. I’ve got much less experience with Coursera, so I haven’t got much grounding to base an opinion on, but I suspect their approach is slightly more calm and collected. I’ve had excellent experiences using both software stacks and cannot really recommend one over the other, though I marginally prefer being able to find the videos afterwards on Youtube. Neither are confining themselves to the techy world of maths and computer science and I’m not alone at being excited when when more classes become available and for free at that! So why’s Dav bothering with all this, he’s already got a degree after all? I’ve grown up with computers and for better and for worse, my approach is intuitive and reactionary. I’ve picked up a huge amount of software engineering (amongst other fields) through experience in the school of JFDI with after-hours classes of ‘oh dearie me it’s broken, understand it all and fix it all now now now’ but I’ve studied relatively little computer science over the years. This has left me in the interesting situation of being good at what I do, but I know I don’t have all the tools I want to use when teaching and coaching others. Everybody has a favourite way of learning, some people like to do things by example, others by being given the problem, a box of tools and their reference guides, others by formal training courses and some like to understand the theory before putting it into practice. Intro to AI was a really good overview for me of the field of applicable computer science, just definings its scope really, coupled with a healthy dollop of stats revision (Bayes, where have you been all my life?). I’m not sure I’ve got the time yet for Andrew Ng’s full on Machine Learning course, but Tim Roughgarden’s Algorithms: Design and Analysis class is proving to be right up my street. I’m familiar with the end results of the content, but it’s very useful to see the workings that got there. I hope to be able to re-use that sort of approach, if only when discussing the finer points when dissecting a particularly horrible query execution plan. I’m not as fluent in Python as I perhaps should be, and it seems to be the defacto language for teaching programming in these days, so these have been good excuses to practice a little. ESRI picked python to replace VBA in their ArcGIS suite of software, so hey, maps! Oh, and did I mention learning’s fun and I don’t have to do it for anything other than kicks and giggles? I would be doing the world a disservice if I did’t mention Khan Academy who have got a libary of over 3000 videos, structured into a linked syllabus tree that takes you from elementary all the way through to post-graduate level details. I dipped into a couple of their modules on probability when I was studying AI, but I haven’t really explored their content much beyond going ‘wow’. I should also mention MIT’s OpenCourseWare who have been putting their course materials freely online since 2002. Indeed it was this discussion on slashdot that sowed the seeds in my mind for participating now. This entry was posted in General Gubbins on June 7, 2012 by Dav Stott. Hello internet, remember me from 7 months ago? What’s that, you ask? Yes, I’m still alive but it’s taken me until now to recover from a veritable barrage of poor excuses as to why I should stop spending time writing Stuff. There’s another 2 or 3 interesting recipes on their way soon, but what better way to resume from hiatus but with a rambling piece of vanity editorial opinion. Last autumn was taken over by the idea that I had time to do two evening classes in a single term. It turns out that I could, but that it didn’t leave much time to write home about it afterwards. The dinner party cooking class was as good as ever, but the real wake up call was doing Stanford University’s Introduction to Artificial Intelligence class. I’ve never had much of a computer science background and yet I’ve made a career out of bending computers to my will, so this was wonderful opportunity to find out if I could still learn university level stuff after 12 years. The answer was yes I could, but it helped that I was properly interested in learning it and it was taught by two experts both in their subject matter and in teaching it to people. Whilst I am proud of getting an “84%” for my efforts, there were enough other people in the class of dozens of thousands who were distraught at the idea of not getting 100%, so that was a different idea of ‘normal’ I hadn’t met before. I could write pages and pages about my experiences, and perhaps I will, but this isn’t yet the time. What has really rekindled my energy and focus was a game changing conference I attended in London last weekend, PHP UK 2012. I’ve been to a few techy conferences before, organised by The IET, vendors, or by the community of customers they serve. Scotch on the Rocks has been, and will probably continue to be my primary conference simply because it’s based on the language I’m most practiced in, but CFML will never have the same sized audience as PHP. The London PHP user group has retained enough critical mass to host an increasingly awesome conference for 7 years now, attracting some top tier speakers and a good sized audience, but not so big that you can’t move or get close to the speakers or exhibitors. Who do I call a top tier speaker? You’ve probably come across names like eBay, the BBC, WordPress.com, Etsy.com and Rasmus Lerdorf, but there were some excellent talks from engineers closer to those I would consider my peers. I took home nearly as many points on presentation skills as I did technical ideas. I was able to speak with a few of speakers and many had spent weeks of their spare time preparing, practicing and refining their 40 minute presentations for this event, which is an inspiring amount of effort. I realise that we were in the capital city, but I was surprised by how many people wrote on their delegate badges, or on their presentation slides “we’re hiring”. Some people even trolled the twitterfall (more on that in another post) to say things like ‘I’m hiring, DM me’. Thinking about it, it’s a great way to meet like minded people who might want to help you do whatever it is you’re trying to do, but I hadn’t encountered it before. Did you take more than 10 seconds to revert the change once you realised something was wrong? Did anybody die? Did your company lose a significant amount of trust, goodwill or money? If the answer to all of the above was ‘no’, then no harm was done and aforementioned developer has just learned some very valuable lessons and won’t be doing that again in a hurry. Clearly this approach only applies to a certain category of applications and user bases, you wouldn’t want to bork something like Amazon’s checkout system, or Google’s landing page for even a couple of seconds, but I believe that the person who best understands the implications of releasing some code is the person who’s just written it. I think the audience was split 50/50 between those that thought this approach was normal and why would you take the time to do it another way, and those that couldn’t believe somebody could even contemplate such a thing and how could they get away with such a cowboy attitude, but it can’t be all that terrible with services like Flickr and WordPress doing it. Some people call this continuous deployment, for me this falls into the mantra of ‘minimum necessary to get the job done well’. From a personal point of view, the biggest ‘whoa’ moment came out of a panel discussion on scalability. Like most of the panel members, I think scalability is a function of systems architecture and how inspired your engineers are, not the programming language you use (assuming one’s code isn’t crap of course), so the conversation was widely applicable. It was a very good discussion and well worth the time to re-watch. I’ll have to wait for the videos to be edited and published to check the exact words, but one question was about fixing technical problems when a bug only manifests for 1/4% of your 10^7 hits. Hugh E Williams from eBay said that if you hired engineers who were good at learning then they’d figure out almost anything, but it helped to be able to wheel out ‘that one guy’ who had that rare blend of curiosity, enthusiasm and doggedness who’s highly skilled in system operations and software engineering who could meditate on the problem (Amiga style) for a week and then fix it. Rasmus weighed in with a comment along the lines of ‘hire him. just hire him’. A few people in the audience weren’t certain what they meant, isn’t this a really big single point of failure and anyway the split between programming and sysops exists for a reason. I think halfway through the explanation, Rasmus said something like ‘yep, we get it’. I don’t know whether it’s the weight of culture or if devops has taken sufficient root in The Valley for this to be normal, but whatever the understanding, it was like they’d just described me and what I do in just a few words. Whoa. So there we have it, community conferences make you feel more connected with other people doing what you do. Who knew? This entry was posted in General Gubbins on March 4, 2012 by Dav Stott.